From the Cumberland Gap to the Atlantic Ocean, this is Virginia Water Radio for the week of February 23, 2015. This week, we start with a tune named for a widespread kind of bird whose small size makes it a familiar symbol in human culture. You’ve been listening to part of “Sparrow,” by Andrew and Noah VanNorstrand, from their 2004 album, “Driftage,” on Great Bear Records. This lively music fits its namesake: songs among the many species of sparrow are lively and diverse. Have a listen for about 10 seconds to a sample from three species. 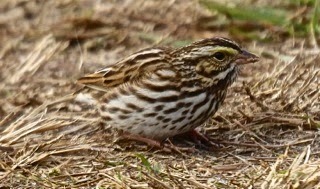 Those were songs of the Savannah Sparrow, Seaside Sparrow, and Swamp Sparrow. These three are among approximately 50 North American species in a family of birds that includes sparrows, juncos, longspurs, snow buntings, and towhees—collectively called the “New World sparrows.” All have short, cone-shaped bills for feeding mostly on seeds, although insects or other animals can be a big part of their diet during breeding. About 30 members of this group are known to occur in Virginia, either as summer breeders, winter residents, year-round residents, or seasonal migrants. The birds actually named sparrows are typically small and brown with streaks on their back and sometimes on their breast. As shown by the names of the three species you heard, different sparrows occupy a range of habitats, including various water-related habitats. Identifying a particular sparrow often requires knowing its habitat, along with distinguishing among the different sparrow songs, because individual sparrows can be hard to spot, and if you do get a look, different species can look very similar. But one kind of sparrow—one that’s not classified by scientists with the “New World” sparrows—is quite commonly seen and heard. That’s the House Sparrow, or English Sparrow, a native of Europe and Asia that—since its introduction to North America in the 1800s—has become one of this continent’s most widespread birds. Sparrows at a backyard feeder in Blacksburg, Va., Feb. 27, 2015. Savannah Sparrow near Gainesville, Fla., Jan. 29, 2015. Photo by Robert Abraham, used with permission. The sounds of the Savannah Sparrow, Seaside Sparrow, and Swamp Sparrow were taken from the Stokes Field Guide to Bird Songs-Eastern Region CD set, by Lang Elliott with Donald and Lillian Stokes (Time Warner Audio Books, copyright 1997), used with permission of Lang Elliott, whose work is available online at http://www.langelliott.com/ and the “Music of Nature” Web site, http://www.musicofnature.org/. A Guide to the Identification and Natural History of the Sparrows of the United States and Canada, by James D. Rising with illustrations by David D. Beadle, Academic Press, San Diego, Calif., 1996. Life in the Chesapeake Bay, by Alice Jane Lippson and Robert L. Lippson, Johns Hopkins University Press, Baltimore, Md., 2006.